1. Put all ingredients for the blueberry swirl into a small saucepan, and heat, stirring frequently, until blueberries are soft, and mixture becomes syrupy. You’ll want to do this first, because it can take a while to cook down. 2. Place pecans and ginger snaps into the food processor, and pulse just until everything is nice and crumbly. You don’t have to pulverize them. 3. Melt the butter in a small container in the microwave. 4. Mix cookie/pecan crumbs with melted butter, and spread across the bottom of a 9×9 baking pan. Use the bottom of a glass, or other hard object to press down the crust mixture so it adheres together and stays in place in the pan. 5. 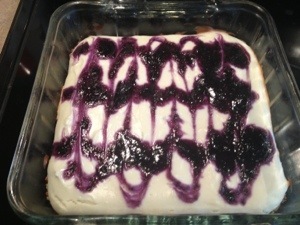 If your blueberry mixture is getting syrupy, remove it from the stove, and place it in the fridge to cool. 6. Throw all of the filling ingredients into a medium sized bowl, and use a hand mixer to mix them until the mixture is smooth. 7. Use a spatula to carefully smooth the cheesecake mixture over the top of the crust, evenly. 8. Remove blueberry mixture from the fridge, and place it in the food processer. Blend until mixture becomes smooth. 9. 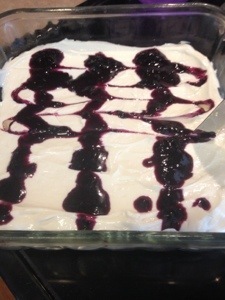 Spoon blueberry mixture into about 4 lines over the top of the cheesecake. I only used about ½ the blueberry mixture, because it’s all I needed. However, I couldn’t successfully make a ½ size batch, so I just saved the rest. 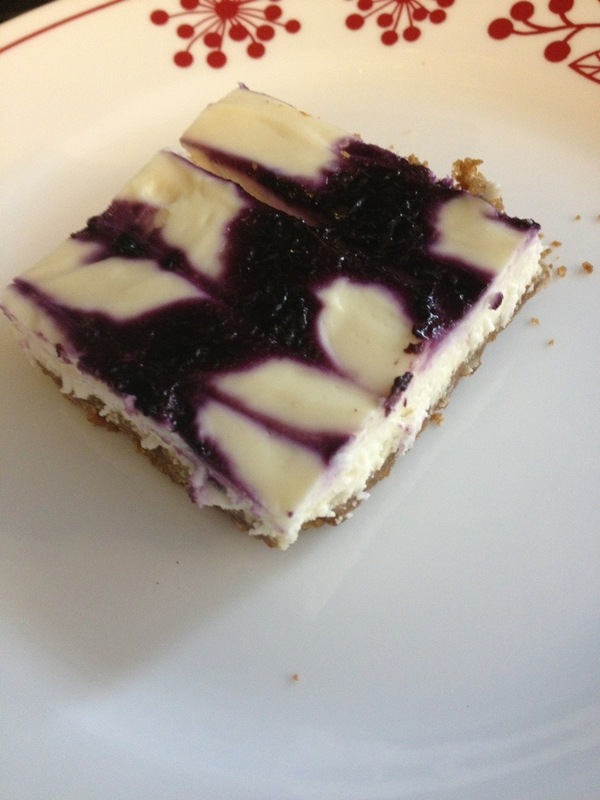 It would be good over ice cream, pancakes, or freeze it and use it the next time you make cheesecake bars! Note: My calorie count here only uses ½ this blueberry mixture. 10. Use a butter knife and drag it through the lines of blueberry, going the opposite direction of the blue berry lines. This creates your “marble” swirl look. Go up and down across the pan until you’re happy with the look. 11. Bake at 350 for 30 minutes. Remove and allow to cool on the counter for about 20 min, then place in the refrigerator for about 2 hours before serving.